Looking to fill that precious corner space with a practical solution...Hale Wood Veneer Bookcases fit the bill. 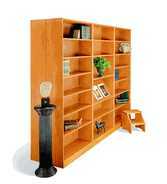 These bookcases are available in numerous heights and finishes. The Quaint English Collection is a classic style that never gets old. "Old World Design" combined with Hale quality, makes these bookcases the centerpiece of any office decor. Sale Price: $589.00 FREE Shipping!